Huawei has now officially announced Huawei Ascend G700 smartphone at IFA, 2013 in Berlin, Germany. This phone is a feature a 5 Inch HD displays and comes with a price tag of $310. Indian Market has many devices in the 15,000 to 20,000 INR range with HD display and MT6589 processor, let’s take a look and find out what Huawei brings new to the table. Huawei Ascend G700 comes with a 5 Inch HD IPS LCD screen with 720p HD resolution. IPS screen will ensure good viewing angles and the pixel density will be 294 pixels per inches. This is a good clarity display at par with likes of Micromax Canvas 4 and Lava Iris 504q. The processor is low cost MediaTek MT6589 1.2 GHz Quad core processor which is quite common in lower mid range smartphones. This processor is backed by a RAM capacity of 2 GB which is certainly above average. The internal memory is again above average at 8GB and can be further extended up to 32 GB using a microSD card. The primary Auto Focus camera comes with an 8MP sensor and LED flash. This camera is capable of Full HD 1080p video recording at 30fps. A secondary camera of 1.3 MP is also present for video calling. 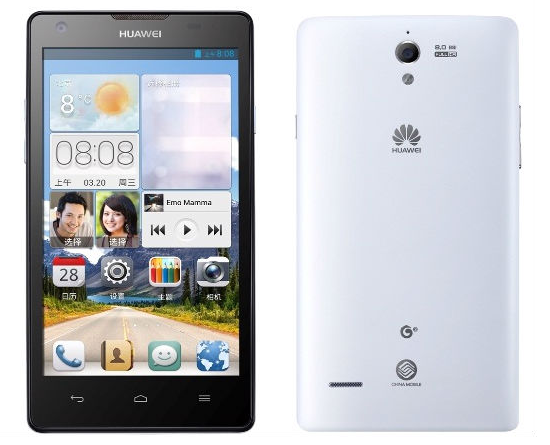 On the software front this phone comes with Android 4.2 Jelly bean Operating system with Huawei’s Emotion UI on top. The differentiating factor is its 2 GB RAM which gives it an edge in the overcrowded budget Quad core Indian Market. This phone will be competing with phones like XOLO Q1000S, Lenovo K900, Wammy Passion Z+ and Intex aqua i7.